Equipments Calendering Plant – Our company mainly engaged in production of machinery of Calendering Plant. Calendering Plant is designed to shape proper type of material. Generally material is passed through a series of gaps of decreasing size made by a stand of rotating rolls. Each Rollers designed for high quality and accurate thickness per requirement. Equipments Calendering Plant, Rubber sheet thickness determined by final roll gap. Winder with accumulator and edge trimmer, two stage unwinder process uncompromising with flexibility. Two stage unwinder designed for better quality and to improved production reliability with accuracy. Effective Tow Stage Unwinder process with accurate and high production in calendering plant. Automatic Web Aligner System also called Hydraulic Power Pack units, these are used to automatically guide materials of any width, at any speed, under any load. Completely self-contained with sensors to guide web edge, with an integral air pump. Web Aligner Systems eliminate the need for additional air regulators or plant air. Modular construction and sub plate-mounted components provide maximum ease of servicing. Inherent capabilities of Automatic Web Aligner System with air Pressure Power Units are available in models from 1/4 H.P. to 3 H.P. Web Aligner System is much more than just an energy source. It’s designed for accurate and high quality edge guiding system. However, because it normally furnishes modulated power to the actuating devices. It’s amplifier of control signals, also power source In addition to providing hydraulic power for the actuating circuit the power unit produces pneumatic power for the sensors. High quality sensor supply pressure must remain constant, and the power supply provides this element. Water, oil and scale contamination and other miscellaneous plant air problems are also avoided. Accurate accumulation process for Wind-up accumulators, and high quality universal spreader at accumulators. It minimized roller deflection prevents cord accumulation and fabric folding. Two Stage Winder designed for accurate and high quality wind up system. 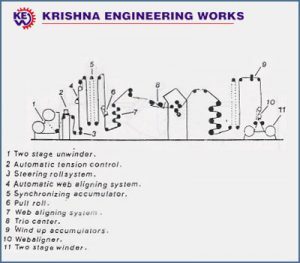 Roll system is designed to work together for fabric edge guiding system.